It's an early call, but local economist Pete Faulkner thinks the "worst" of our unemployment woes might be behind us in Cairns. In a cautious note on the latest job figures for June, Mr Faulkner said Cairns experienced a "more positive month with some increases in employment". According to the Conus/CBC Staff Selection Employment Trend data, the trend unemployment rate dropped to 6.5% and 300 jobs - almost all of them part-time - were added to Trend employment. Our city's notoriously high youth unemployment has fallen to 12.6%, which about the same level as the Rest of Queensland average. In another spot of bright news, the time spent searching for work dropped to 17 weeks - the same level as the Queensland average. The city's 6.5% unemployment rate is now more in line with the State trend which sits at 6.1%. The local rate had spiked to nearly 10% at one point in 2016. But Mr Faulkner warned there was less to celebrate when looking at the annual trend. 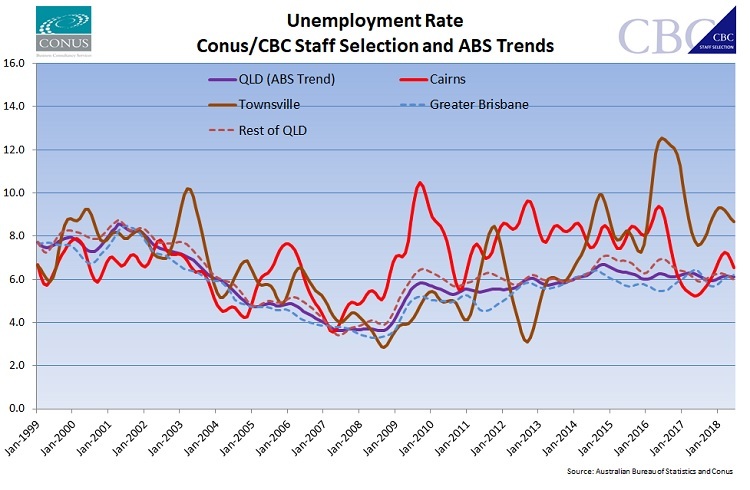 "Annual trend employment growth now stands at just -6.0% in Cairns versus +2.6% for Queensland, +2.0% in Greater Brisbane and +3.2% in the rest of Queensland," he said. "Annual employment has now been negative for five months. Over the course of the past 12 months, most new employment has come in the youth cohort (+5,500) with the middle-aged seeing drops (down 7,100). "Unfortunately, the improvement that we had been seeing in full-time employment has evaporated in recent months with full-time now down 13,400 for the year. "The increase in the trend unemployment rate over the year is being driven by that decline in employment, and subsequent increase in the unemployment rate, in the middle-aged cohort. "It now appears confirmed that the labour market in Cairns has been weakening for some months despite the apparent strength exhibited by the (very lagged) official annual average numbers, although this recent drop back in the trend unemployment rate might suggest that we have now seen the worst." Mr Faulkner said the only sector experiencing significant gains in employment over the past 12 months was health care, with declines seen in education and training, manufacturing and (perhaps surprisingly) construction.